There is nothing sadder to see than heritage sites being damaged by the elements or extreme events such as earthquakes or floods. However, when this damage is because of deliberate vandalism it is sickening. 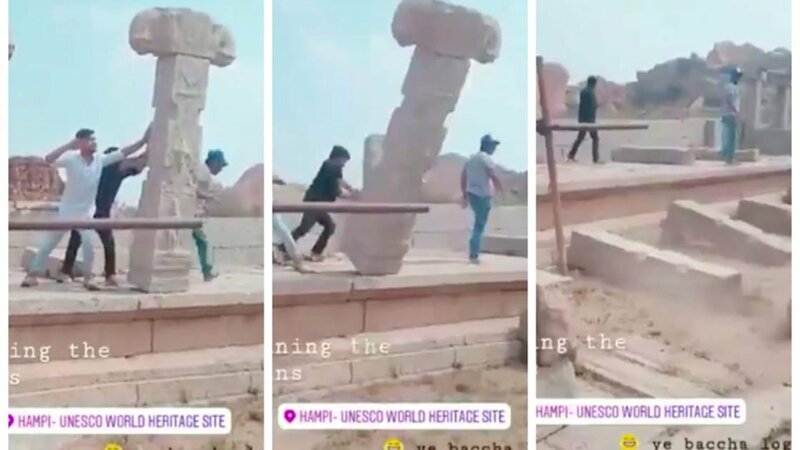 In India, video footage has emerged on social media that shows a group of young men deliberately damaging one of the country’s most important heritage sites. This has provoked a great deal of anger and has led to questions about the government’s efforts to protect the nation’s most important historical monuments and treasures. Earlier this week video footage began circulating on social media sites which showed four males vandalizing a 14 th century Hindu Temple in the Hampi heritage complex in Karnataka, India, reports the Conde Nest Traveller . The video shows a gang pushing over some stone pillars. Based on the footage they toppled at least six stone pillars. The pillars were free-standing, and some had intricate carvings on them. Unbelievably, the brazen vandals uploaded the video on Instagram. One of them at least was apparently proud of his vandalism. The username of the person who uploaded it was identified even though his account’s personal details were deleted. It is reported that the person has been identified as a well-known local music producer, but this has not been confirmed. The toppling of the pillars has irretrievably damaged the sanctuary. It is a temple that was dedicated to the god Vishnu also known as Indra, who is one of the most important deities in Hinduism. The toppling of the pillars has angered many local Hindus. In response to expressions of outrage on social media the “police visited the spot and confirmed the damage” reports Conde Nest Traveller . The Vishnu Temple is located in the Hampi heritage complex, which is a UNESCO World Heritage Site. This complex holds the ruins of Vijayanagara once one of the biggest cities in the World. Its ruins and buildings, mainly dating from the 14 and 15 th century, are generally very well-preserved. The Hampi complex extends over an area of 16 miles (25 km). The city was the capital of a powerful Hindu state, the Vijayanagara Empire which long battled the Northern Muslim states, and which became fabulously wealthy and renowned for its patronage of the arts and, especially architecture. 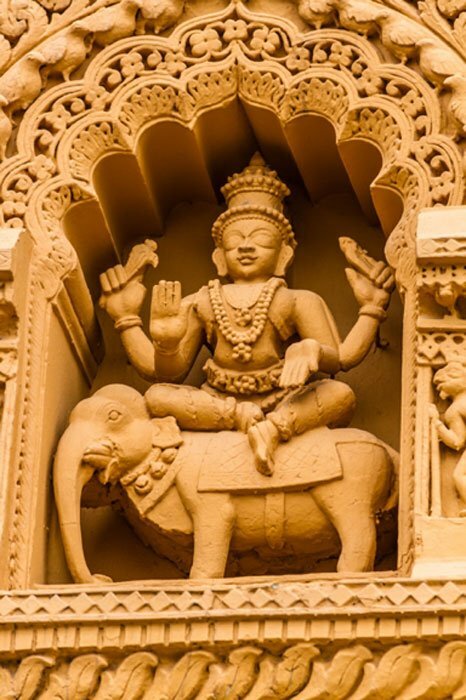 There are many some 1600 Hindu, Jain, and Muslim monuments at the heritage site including palaces, temples, markets, elephant stables, and public baths. The complex which for long had been difficult to visit “had only recently opened to tourists” reports Newscom.AU. The circulation of the video showing the vandalism has generated a great deal of controversy. It seems that the local police force was not even aware of the damage done to the temple. They claim that the destruction only occurred recently. However according to Newscom.AU. “the Archaeological Survey of India authorities suspect that the incident might have occurred two years ago”. The apparent confusion over when the destruction took place is proof according to some that the police and local government are not doing enough to protect the country’s national heritage. There has long been criticism of the lack of resources given to the protection of India’s many heritage sites. Moreover, the relevant authorities assigned to protect the nation’s historical sites have been accused of incompetence. There are some who claim on social media that the toppling of the pillars may be part of a campaign targeting Hindu religious sites in order to increase sectarian tensions in the vast country. A local government minister has promised to punish those who carried out the vandalism. According to Newscom.AU, the police have stated “that one young man had been arrested in relation to the incident”. Investigations are continuing and there is a hunt for the other three culprits. It is hoped that the shocking footage will persuade the authorities to do more to protect the history and heritage of India. Top image: Hampi’s UNESCO world heritage site being wrecked by vandals. Source: YouTube. They'd have to arrest 90% of the gov't of India bureaucracy. Hope they make examples of them. Prison terms, not just fines. Seems to me some sort of strict deterrence might help prevent future such incidents. If it was actually done two years ago, I would include the authorities that have ignored it for so long as well, for derelection of duty.